First layer: Combine first three ingredients above. Mix thoroughly and put into a 9" x 13" pan. Bake for 15 minutes at 350 degrees and let cool. Second layer: Combine cream cheese and cool whip. Mix together, spread on top of first layer and let chill. Third layer: Combine pudding mix, milk and flavoring. Mix and beat at low speed until thickened and pour over top of 2nd. Layer and chill again. 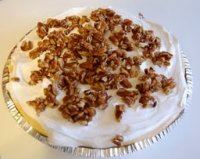 Fourth layer: Top with additional cool whip, and sprinkle with chopped pecans. Chill again.